If you’re thinking about preserving food through pressure canning and want to know what the best pressure cooker for canning is, we’ll tell you what the top options are here. However, before we do that, let’s first go through some must-know facts about canning that pertain to food safety. When it comes to preserving food safety has to be your top priority no matter what. Canning involves removal of oxygen from the container before sealing it and then raising the temperature to a rolling boil while also increasing pressure to raise the temperature even higher to destroy dangerous bacteria. The can is finally vacuum sealed and ready for storage after cooled. High acid foods like fruit preserves and jellies can be canned at a lower pressure because the acid helps to kill those microbes. Home canning of low acid foods, like vegetables, meat and even tomatoes, needs a higher constant temperature of 240 degrees Fahrenheit. Modern electric multi-cookers may come with a canning function but the National Center for Home Food Preservation, a unit of the USDA, does not recommend doing so because that continuously high temperature and pressure cannot be reached nor guaranteed. So, what is the best pressure cooker for canning? It must be a stove top one and must be able to hold at least 4 quart jars at a time. This is to ensure the right amount of time for the high temperature and pressure to be reached, which is too short with a traditional small pressure cooker that you use to only cook food. Canning cookers have thin walls with metal or rubber gaskets and a removable rack to hold the jars. A dial or weighted gauge indicates and regulates the pressure. So keeping this in mind, our best pressure canner reviews only cover products that meet the above recommendations and are solely designed for canning. For more information on canning, including the how, why and what, go to the NCHFP’s website. If interested, you could also take a look at food dehydrators and vacuum sealers for other ways of preserving food. 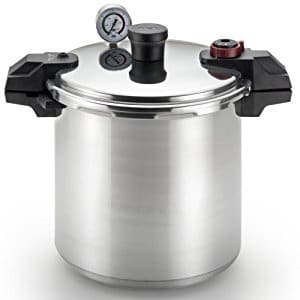 Here is a pressure cooker and canner that is on the higher end in terms of price but we rate it as the best pressure canner you can buy so the cost is justified. You can find this in several sizes, and for this review, we focus on the 21.5 quart model that can hold up to 7 quart jars or 19 pint jars. The one step lower size of 15.5 quarts can also be used for canning and you can get 3 larger sizes as well. The All American 921 can be used both for canning and for preparing large cuts of protein that require tenderizing under pressure. The All American pressure cookers use a metal to metal sealing method. They don’t require a rubber gasket, which can break down over time and eventually will need replacing. The pressure regulator on this unit has three PSI settings and two automatic overpressure release features. Two other nice features are the geared steam gauge and the stay cool bakelight handle. The construction is of heavy cast aluminum that allows for even heating temperatures throughout. The one drawback to the construction is that it is somewhat heavy to lift when the pot is full. It weighs 20 pounds when it is empty. The manufacturer’s website warns that it might be too heavy for a glass cooking surface. The overall height is 15-3/8”. The inside dimensions are 10-1/2” high and 12-1/4” in diameter. This is capable of holding a good amount of canning jars in different sizes. The 921 pressure cooker and canner appears to do all that it promises for the price. The manufacturer only offers a limited 1 year warranty from date of purchase. The Presto 01781 pressure cooker is quite a large residential kitchen cooker/canner at 23 quarts capacity. However, it weighs less than some of its competitors at 12 pounds, making it easy to lift. The overall dimensions are 15.4 x 15.1 x 14.8 inches. The construction of the pot is warp-resistant, heavy gauge aluminum that can be used on any cooking surface. The item ships with a 76-page instruction and recipe book. And, the manufacturer includes an extended 12 year limited warranty. There is an easy to read pressure dial gauge that registers the complete range of processing temperatures. There is a standard pop-up pressure indicator and a steam release mechanism that help to prevent too much pressure from building up. The lid locks tight to the base by the use of an inner sealing ring. You will need to replace the sealing ring and most likely the blow-out plug over time. These are easy to find online or at some retail hardware stores. The Presto is relatively easy to clean because the ring, the air vent/cover lock, and the overpressure plug are removable. Unfortunately, the lid cannot be fully immersed, so it needs to be cleaned more carefully. The pressure gauge is delicate, as is common in similarly styled cookers. For the price, this is the best canning pressure cooker to live up to its reputation for a large capacity home unit. It may be too large for some stovetops at 14” in diameter, so be sure to measure your heating surface before deciding to purchase this. T-fal added the P31052 home pressure canner and cooker to its lineup of small kitchen cooking equipment not too long ago. This is another large cooker with a capacity of 22 quarts. It can easily hold 16 pint size or 7 quart canning jars at once. The unit ships with 2 cooking racks for easy stacking and to help prevent food from sticking to the bottom of the pot. The rust proof, heavy-gauge aluminum construction heats quickly and evenly and can be used on any cooking surface. The T-fal P31052 weighs 14.8 pounds and measures 19.3 x 15.4 x 16.3 inches. While it is a large piece of equipment, it is still a good weight for lifting. As with most of these large capacity canners, measure your cooking surface and the height from the bottom of the cabinet or range hood to the stovetop surface to be sure it will work within the space of your kitchen. The pressure control offers 3 standard cooking options: 5, 10, and 15 PSI. There is an overpressure steam-release safety component and pressure monitoring device built into the handle. The pressure monitor is not that easy to gauge. It is a red pin embedded into the handle that pops up when the pressure is optimal. However, it doesn’t rise above the handle, so you have to keep an eye on it. Otherwise, the pot is simple to use. Cleaning is best done by hand, without immersing the lid. The rubber seal gasket on the inside of the lid, and the stem release, can be removed for cleaning. The manufacturer offers a 10 year limited warranty on the canner with a 1 year warranty on replacement parts. You can order replacement parts online. You also get easy to follow instructions and recipes with this well priced pressure cooker/canner. If you are looking for a smaller pressure cooker, the Fagor Duo 10 Quart might be right for you. It will still allow you to can up to 4 quart size jars, which is the minimum capacity advised by the NCHFP. And, it arrives with a steaming basket, canning accessories and tools, a recipe booklet, and a 10 year warranty. The body is constructed of stainless steel, which is likely to account for the slightly higher price. The lid is interlocking. However, there have been instances where the lid doesn’t line up with the base, resulting in the unit having to be replaced by the manufacturer. This cooker is fairly simple, which many novice home cooks and canners may prefer. There are only 2 pressure settings: low at 8 PSI and high at 15 PSI. All the safety features are there, including a dual pressure control valve, a visual pressure indicator, two independent over pressure release valves, and a locking handle that prevents accidental opening under pressure. It does not have the pressure gauge that makes some of the larger and more sophisticated canners a little bit more delicate to clean. The gasket can be removed for cleaning. The Fagor Duo will work on any cooking surface, electric or gas. It weighs less than 11 pounds and fits nicely on most kitchen stovetops, measuring 17.3 x 11.3 x 10.7 inches. This smaller workhorse is ideal for any size kitchen and for home cooks of all experience levels.